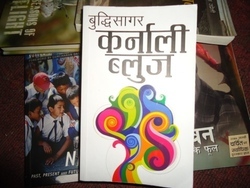 Karnali Blues is an excellent novel by the poet/writer Buddhisagar. Although it is his first novel, it could not have been better even if he was an experienced novelist. The novel expresses the story of the struggle of a lower middle class father in Far Western Region of Nepal through his son’s eyes. The presentation of the novel is great and the readers are bound to move along with the characters in the story. The story starts with the short narration related with the story of the birth of the son, Brishabahadur. The book is divided into eleven parts, each mentioned as a day. The novel is part present and more of a flashback. The narrator, who himself is the writer, comes to visit his father and during the eleven days that he spends taking care of his sick father, his mind drifts towards the past. The changing perception of the son regarding his father is expressed beautifully in this novel. 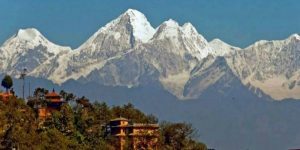 The plot is set in the Far Western Terai as well as Mountain Region of Nepal, from Matera village to Katase Bazaar to the headquarters of Kalikot. The writer, born to a doctor spends his early childhood in Matera and as he grows up, the place changes. His father, in search of better life for the family, keeps them moving from one village to another until they finally settle in Kalikot. Son believes that there is no other person as wise, as loving and as strong as his father, however, his perception of his father changes as he grows up. The story is balanced with humor as well as heart touching stories. The playfulness and mischief of the children makes you laugh while the stories of various characters bring tears to your eyes. The book is successful to take the readers into the life and hardships of people living in the far western region of Nepal. The novel moves along with introduction of various characters and the story of their struggle. The plot, character, presentation and the language of the book are very good. Although the book is written in Nepali, there are many places where the writer has used the typical language (Tharu language and the language used by porters as well as people in Kalikot) of the people and communities residing in the Far Western Region. Karnali Blues published in 2067 BS has already printed three editions within two years time and has become one of the most popular books in Nepal. Although the book is the first attempt of the writer and poet Buddhisagar as a novelist, the book is excellent and has set a new milestone in the field of Nepali literature. The book that marks the birth of a new promising novelist in Nepal is a must-read for all.